Yesterday, we talked about the profit and loss statement at Kaley's Knits. Let's briefly review the profit and loss statement one more time. There are two lines that tell us a story. First, look at the gross margin percentage line. 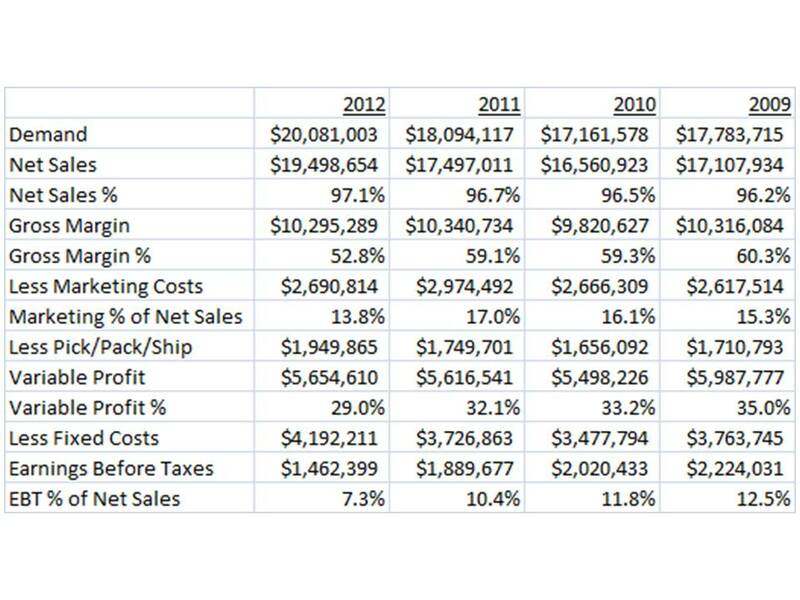 In 2009, 60.3% of every dollar sold was converted to gross margin. In 2012, only 52.8% of every dollar sold converted to gross margin. When I observe something like this, I ask Management what happened?! 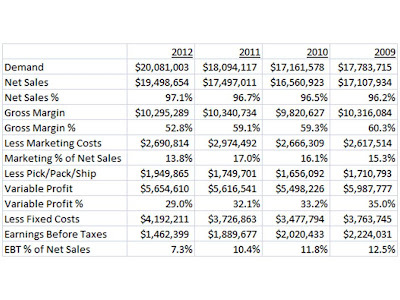 Often, gross margin percentages decrease as discounts/promotions increase. When promotions like 20% off are added to the marketing mix, we sometimes see the discount applied to gross margin dollars. In other companies, the discounts/promotions are tucked into the marketing line, which actually yields a more interesting and insightful profit and loss statement. Look at the marketing costs line, and the marketing percentage line. Management at Kaley's Knits clearly made a strategic decision to spend less money on marketing in 2012. Sometimes, this happens when Management observes an imbalance in the profit and loss statement. In other words, when the profit and loss statement isn't working well, Management cuts back on marketing expense, in order to balance EBT (earnings before taxes). Every analyst/marketer/executive needs to be able to analyze a profit and loss statement, in order to understand how the business is performing. Kaley's Knits is not performing well, in spite of reasonable top-line demand growth.